It was love at first sight with this skirt by Denis Gagnon – with faux leather pleats, a high waist and a badass zipper detail, how could I say no? This is my first piece from the designer, but I’ve certainly become a fast fan. All of his pieces on SSENSE are incredible! Think lots of volume, gold hardware and black. Anyway, back to the skirt. In order to offset the edgy style of the skirt, I paired it with my favorite classic Theory shirt. I feel like this outfit would be ideal for a work party or after-work event. Even though the skirt edgy, it’s basic and classic enough to wear year-round. Some other pieces I’ve craving from SSENSE right now include this sunny yellow Givenchy clutch and these embellished sandals by Burberry Prorsum. So much good stuff right now! PS – Did you know you can vote for me everyday on Vanity Fair’s International Best Dressed contest? I’m so appreciative of your continued support and votes. Click here each day to vote on each look again! A big THANK YOU to my amazing readers! That skirt is amazing, love the details this is an excellent buy. Love this look! Gorgeous skirt! Oh goodness, I’m in love with that skirt! The detailing is stunning! Absolutely stunning – that zippered detail is so unique and this skirt looks amazing on you! This skirt is beautiful and seriously epitomizes the perfect balance between classic + edgy- love how you styled it with the white button down! that skirt is an absolute stunner! i love the way you styled an otherwise edgy piece to make it seem more feminine and traditional…gorgeous merritt! Ummmm WOW that skirt and the whole outfit is amazing! You look gorgeous!!! I regret not buying those Zara sandals last year! 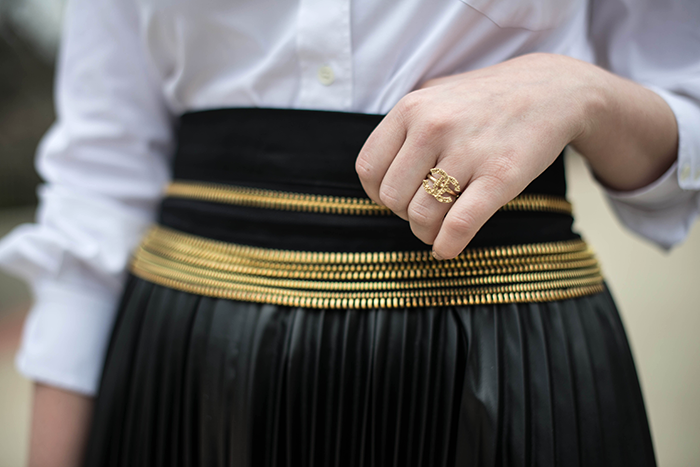 Love the zippered detailing on your skirt! That skirt! How stunning! Love how you styled it with a crisp button down, love this look Merritt!! I love love love this look!! The skirt is fairly reasonable too! So classic! OMG, this skirt is just too fabulous. Earring Giveaway on the blog today! LOVE the details on that skirt! It’s such a great contrast to a crisp white shirt. This skirt is so gorgeous! Love the gold zipper detail. Classy and gorgeous. I love your ring! Great look! That skirt is amazing!! That skirt is SO cute! Going to vote for you right now..! That skirt is fabulous I cannot even contain myself right now! Black and white is such a classic combo. 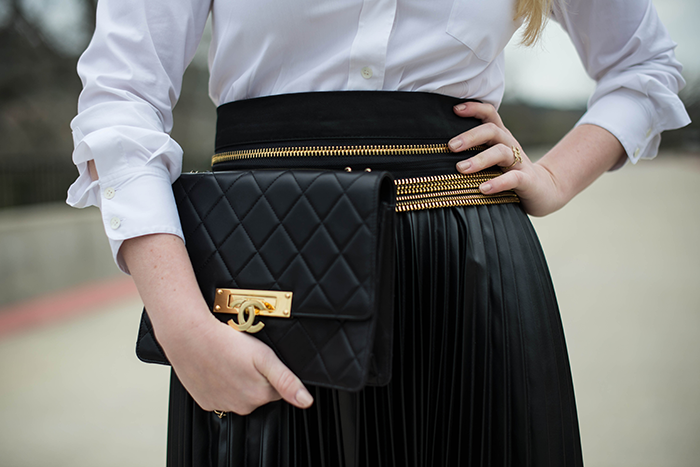 Love the crisp white button down and seriously swooning over that Chanel purse!! Oooh! I like that skirt it is fun, and so unique! Love your taste Merritt! Wow! That skirt is amazing! I love how classic this look is,but still so chic, stylish and updated! Gorgeous. absolutely obsessing over that skirt! love how your paired it with a crisp, white blouse! super chic look – love the detailing on that skirt. Nice skirt, must check out Denis. And, you have my vote. Good Luck! Stunning!!! You look gorgeous and the skirt rocks – love the whole outfit! Seriously SO in love with that skirt!! Badass zipper detail is an understatement :) Love that your outfit is a classic black and white color scheme with the most amazing details and accents! 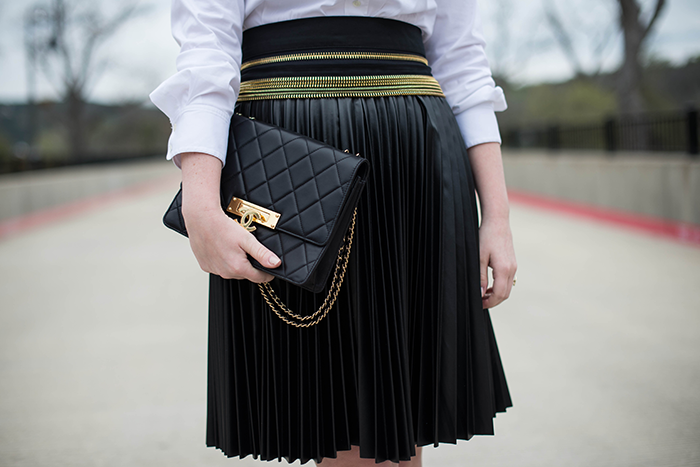 Such a beautiful skirt and it goes so well with that Chanel. gorgeous! Wow, such a show stopper and not at all over the top. love this. Super duper in love with this entire outfit! This is AMAZING! Love love that skirt. And the black and gold is fab! What a great look! Love everything here! The skirt is amazing!